This past November, the art market grabbed headlines around the globe with the record-breaking auction purchase of Francis Bacon’s 1969 triptych “Three Studies of Lucian Freud.” With nearly 500 news stories (and counting), this trio of canvases has garnered nearly Miley-Cyrus-level media attention — a frenzy obsessed with auction prices and billionaire collectors. When it was announced that this series of canvases was going to be on view at the Portland Art Museum as part of our Masterworks series this winter, I immediately began thinking about how one can get past the media craze and dollar signs in order to dig deeper into the core significance of this ‘masterpiece.’ How might we address the complexities of how visitors would experience a work like this? What are some ways in which we could bring audiences into a closer connection with this work? How could I, myself, have an experience with this work in a meaningful and personal way? Perhaps the best way to start tackling this painting was to actually deal with the fraught idea of a ‘masterpiece’ and how that determination effects the experience we can have with art. For me, this type of exploration is best done with others. So early in the New Year, I invited our docents to spend some time with me in front of the Francis Bacon triptych to do some close looking, to connect with some of the scholarship on the work, and to start the process of digging deeper into the work’s significance. With only a few days notice, we had about 60 docents show-up for these open explorations of teaching with and experiencing a modern masterpiece. What Exactly Is a ‘Masterpiece’? 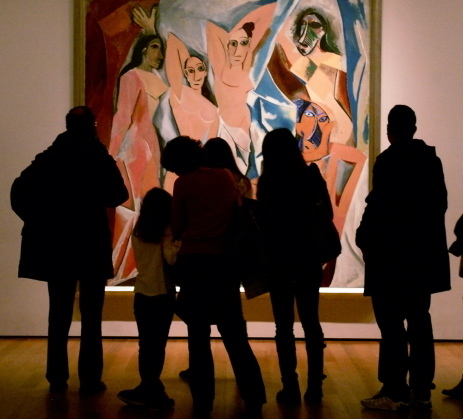 Across the country, visitors consistently flock to museums to see noted masterworks (whether through traveling special exhibitions, celebrated groupings of masterpieces, as part of some museums’ collections). Yet, an artwork’s prestige can create a situation (like the insomniac) in which the pressure to ‘get’ the famous work prevents us from having any type of valuable experience at all. This situation is more common with modern and contemporary art, which might not always meet the traditional or popular criteria of a masterpiece. So what do we mean when we say a painting is a masterwork or ‘masterpiece’? This question is a weighty one and comes with a lot of historical, cultural, and political baggage — yet I began my sessions with our docents by directly addressing this very topic. Faced with defining the characteristics of a masterpiece while seated in front of the Bacon, our group of docents and I discussed how a masterpiece traditionally has “stood the test of time,” or is a particularly iconic work within a major artist’s career. In our conversations, we also touched a bit upon the individual experience we have with a masterpiece — something that draws us in and keeps us thinking, questioning, wondering. In my own experiences visiting museums as well as teaching with art, I do find that certain works of art continuously draw us back in for repeat encounters, offering new challenges and insights each time we sit in front of them. We questioned the idea of who gets to define a ‘masterpiece,’ proposing that perhaps we as individuals get to make that determination for ourselves. While I generally gravitate toward this type of approach, it seemed particularly appropriate as a framework through which to view this visceral and intensely human set of paintings by Bacon. 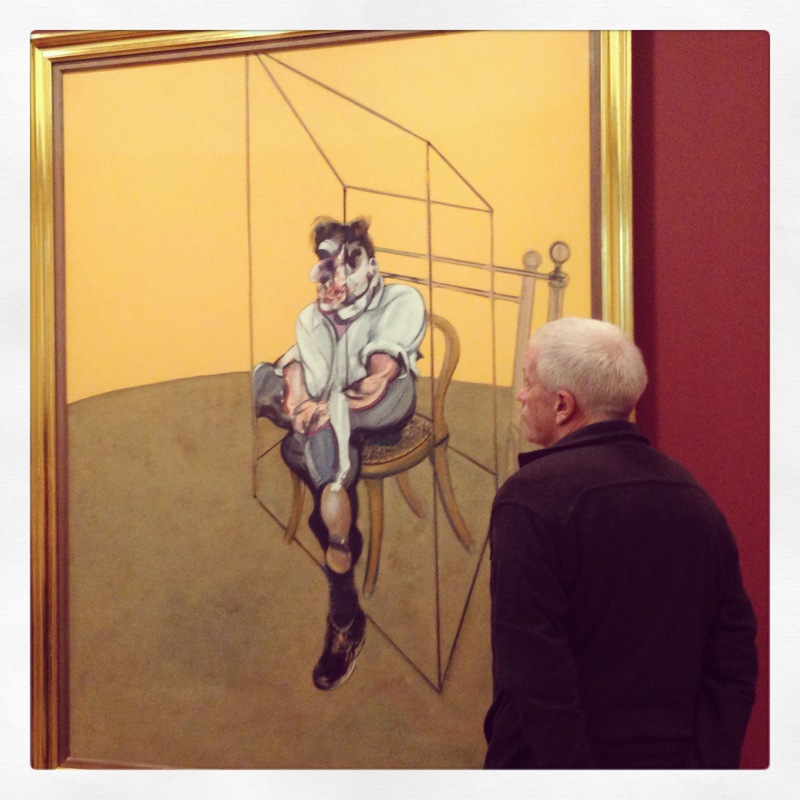 After briefly talking about Armstong and De Botton’s ideas, the docents and I spent much of our sessions with quiet, guided looking followed by small group conversations to talk about what we were noticing, thinking, and wondering with the Bacon portraits. I acknowledged that this would only be the beginning of our experience with these paintings, and read a few quotes from Bacon himself to help us peel back more layers of meaning in these portraits. 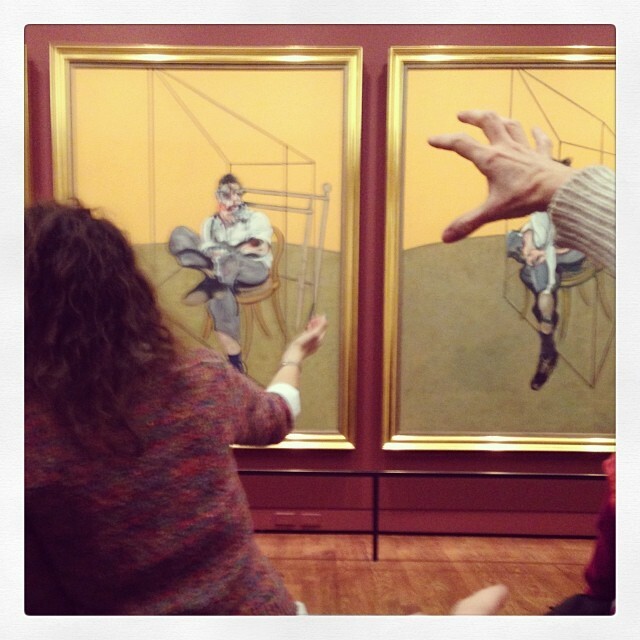 Before we left the Bacon triptych as a group, I invited each docent to return to this painting at another time, sit with the work alone on a quiet afternoon, and spend about 20 or 30 minutes doing some sketches and open reflective writing. For me, the most powerful prompt for this type of written response has simply been “What is this to me?” — a question directly inspired by John Armstong and one that I have used repeatedly in my own gallery learning as well as teaching with larger groups. And I feel that if we can begin to answer this question for ourselves, we can also begin to open up a new type of experience for our visitors with great works of art. It may be these cumulative, layered experiences we have with masterpieces that allow us to change the way we see art as well as ourselves. 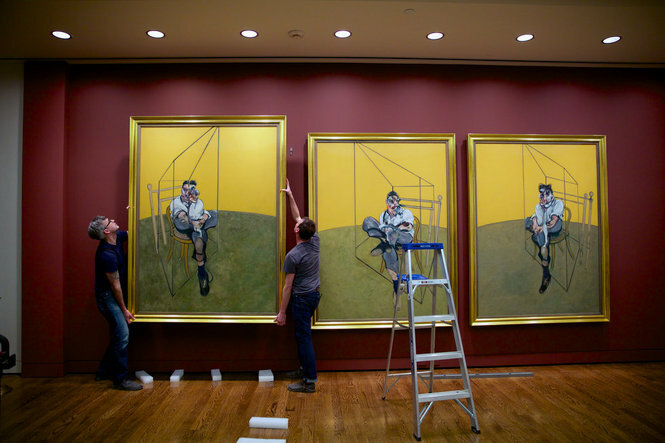 But these types of experiences take time and repeat encounters with a work of art — they don’t happen in the seconds or minutes that we typically spend glancing at a painting such as the Bacon triptych, and they also often don’t necessarily happen when we’re leading a guided experience with an artwork. As I concluded my session with our docents in front of “Three Studies of Lucian Freud,” I encouraged them all to see our collective experience as simply the beginning of a deeper process of looking at this work; a process they would need to culminate on their own, in their own personal way, and in collaboration with future visitors to the museum.